– Benjamin Franklin, letter to Jean-Baptiste Leroy, November 13, 1789. Today, all the political talk is still about taxes … specifically, the Trump/Ryan plan to slash taxes on the wealthy and on corporations. I’ve spoken about this plan before. Today, I want to turn the entire issue on its head. 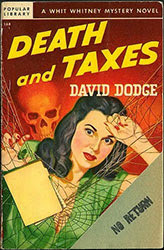 I submit that our national obsession with taxation is misplaced … in fact, it conceals a far more pernicious threat to our collective and individual prosperity … one that’s staring us right in the face. Why Do We Care About Taxes? A silly question, you might say. But it’s one we must ask to get to the underlying truth. We care about taxes because they reduce our disposable income. If by some miracle it were possible to pay taxes without having to reduce our expenditures, few of us would care about them. But care we most certainly do. After all, most middle-class households pay somewhere between 15-25% of their gross income in income and payroll taxes. That’s a lot of potential household consumption and/or investment going to the taxman. But what if I told you that taxes pale in comparison to another drain on many American wallets … and that things are going to get much, much worse soon? The world's most powerful investment bank is a great vampire squid wrapped around the face of humanity, relentlessly jamming its blood funnel into anything that smells like money. The first thing that struck me when I read Taibbi’s article back in 2010 was that he wasn’t talking about taxes. After all, that sort of hyperbolic language is usually reserved for the IRS. But Taibbi was on to something: The great sucking sound we hear is working and middle-class wealth being vacuumed upward to the wealthiest U.S. households … via credit markets. It’s a largely invisible process. That’s because, with the exception of health care, most people assume that the prices of things like housing, education and medical care reflect supply and demand. If life in the U.S. is expensive, it’s because it’s good and in high demand. 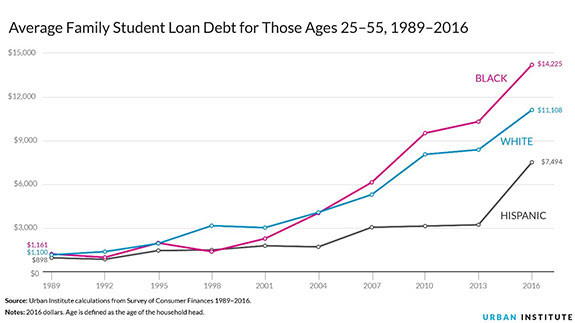 The availability of cheap credit in the U.S. artificially inflates the prices of housing and education. If people had to pay cash for those things, they’d be much cheaper. But they don’t; the U.S. has one of the most debt-based economies in the world. Why is there so much debt in the U.S.? Because there’s so much lending. Why is there so much lending? Because there’s so much debt. As income and wealth inequality in the U.S. has skyrocketed over the last 30-odd years (see chart below), the richest households have increasingly put their yield-seeking cash into consumer lending markets. That’s what happens when firms like Goldman Sachs sell bundles of “securitized” mortgage loans to wealthy investors, for example. This great gusher of excess money looking for yield has found its way into every nook and cranny of U.S. consumer markets. With so much money out on loan, consumers can bid up the prices of goods with a relatively fixed supply, like houses or college degrees. 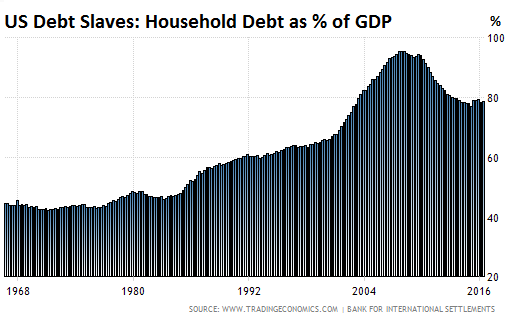 These debt-fueled higher prices translate into increasing flows of money, in the form of interest payments, from borrowers to lenders, and thence to the ultrarich investors who provide the wholesale capital. All the extra money needs to be used, so … back into lending markets it goes. 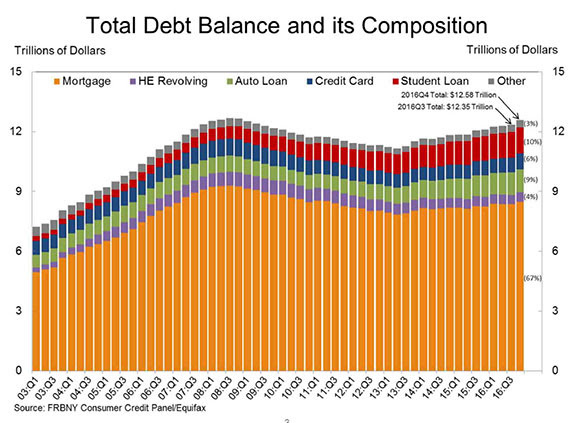 Of course, rising post-2008 debt levels have a lot to do with low interest rates, but it’s not the whole story. Rates will become a very big deal indeed when they start to rise again, however, our interest payments go up, and our disposable incomes shrink. It’s a ticking time-bomb ready to derail any future recovery. The president and congressional Republicans tell us that slashing taxes will put money into our pockets. We’ll spend that money, and the resulting increase in demand will lead to investment and jobs — so much so, in fact, that even with lower taxes, we’ll balance the budget. As I’ve argued, that’s poppycock; deficits will skyrocket. But if I'm right, how can we get more money into American pockets, so we can grow again? It’s simple: Interrupt the vicious circle of lending, debt and the quasi-feudal extraction of interest from middle America by Wall Street and the investor class. 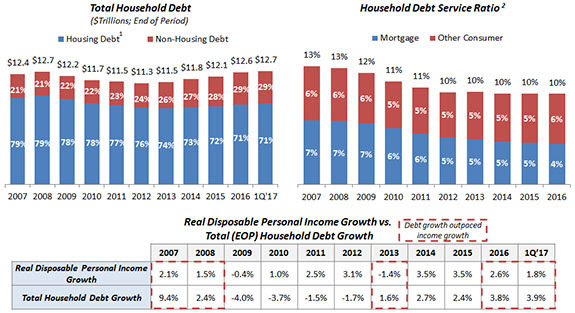 Reducing U.S. households’ debt load would be just as effective as a tax cut … and it would have the added bonus of reining in housing and education prices and not adding to the deficit. Why doesn’t anyone talk about that? Maybe it’s because those who stand to get the biggest tax cuts under the Trump/Ryan plan are the same vampire squids sucking away our wealth in the form of interest.